First appearance "Super Mario: Mario im Wunderland"
Wunderland (in English, "Wonderland") is a place in an unknown location that only appeared in the Club Nintendo comic "Super Mario: Mario im Wunderland." The only known inhabitant of Wunderland is a wizard called Crab, who lives in a castle and is said to be able to fulfill any wish. 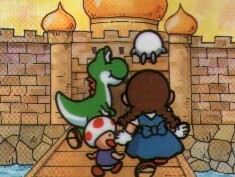 Some other species and characters, that are otherwise found in Mushroom World and other locations, are also seen in Wunderland, such as Whispy Woods, Toad, Kirby, Yoshi, Donkey Kong, Wario, Bowser and a Koopa Troopa. Additionally, during the events of "Mario im Wunderland", Fox McCloud with his spaceship lands in Wunderland and helps Mario and his allies. In general, Wunderland appears as a very green land, covered with trees and bushes. Only Crab's castle and a confusing signpost (with directional descriptions such as "here", "there", "up", "down") are an evidence of the Wunderland's civilization. When Mario is about to help a woman whose house is submerged in water, a whirl catches him and takes him to Wunderland. Moreover, Mario's clothes change and give him a ladylike appearance. Finally, Crab fulfills Mario's wish to get back home, and he also gets his old clothes back. This page was last edited on March 27, 2019, at 10:13.